I cannot really tell you why I am into crocheting personified food items lately. However, I am having fun making these guys. Here's the newest member of the growing "food chain", El Churro! Wow, for a second there I thought that was Martha coming home in her poncho! 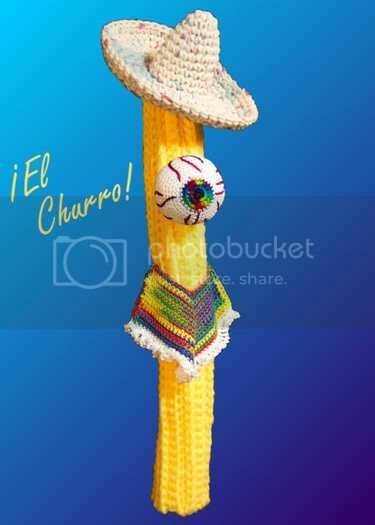 I love churros, and this one is tempting me, although I usually remove the eyeball before deep frying. 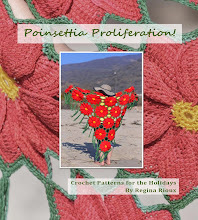 Someone sent me a link to your journal and I have to say these crocheted works of yours are well done, amusing, and somehow the word "disturbing" (in a good way) comes to mind. I just got started in crochet in 2003 and I'm amazed at all of the "ordinary" things that can be created with a hook and yarn. You have definitely proved another dimension to me. Thanks guys! Just wait until I upload the Cheez-It! OMG, I love it! Your art is absolutely positively amazing! The eyeballs while disturbing to some, are rather mythical to me. I wish I had 1/16 of your talent!! Please, someday, put up a pattern (please, I am begging). I absolutely LOVE your creations!!! They are hilarious, amazing and delightfully off-beat!!! Okay, now I am hungry. There is nothing like a greasy, sugary churro!!! Of course, your churro is too cute to eat. Attack of the Giant Squid!